Jason and Rick are emerging from hiatus to bring you a photography workshop in Rocky Mountain National Park. Email us to get more information. More details to come. What we like (and dislike) about photography in the 21st century. Photo Prescription: Set your camera's time zone when you travel. For the MP3 version of this podcast (audio only) click here (20.1MB). Nikon has filed for a battery meter patent that changes the game in terms of estimating battery life and efficiency - instead of just measuring shots taken over the life of the charge, the camera will actually report back what different functions were being conducted. The patent reads "different operating modes," presumably meaning actions as zooming in and out (in a compact digital), Menu and LCD use, card formatting, etc. It then presumably applies values to those actions and applies it against the expected battery life to give a more accurate estimation of remaining power. The update is available on Nikon's Knowledgebase Portal for Windows and Macintosh. As noted on several major retailer sites, the newly announced Nikon D5000 will be available for purchase starting Monday, April 27th. Congratulations to new member Kosta Pavlakos (dj master blaster), of Montreal, Quebec, Canada for providing the winning image in the third week of our Welcoming Photo Contest II 2009. 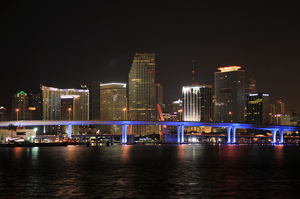 Kosta traveled to Miami, Florida, USA and captured his winning entry entitled "Miami at Night" with his Nikon D300 and AF-S DX Zoom-NIKKOR 17-55mm f/2.8G IF-ED lens. He had his D300 mounted on a tripod and used an ISO of 200, shutter speed at 1.3 seconds, and the lens aperture wide open at f/2.8. He used Program AE for exposuring and had his white balance set to Auto. The lens was close to its long limit, registering at 50mm. As his prize, Kosta will receive a personal license code for Silver Efex Pro software by Nik Software (valued at $199.95 USD). Week Four of the contest has begun. If you register between now and May 5, no matter on which level (from Basic to Platinum), you can participate in this contest. Complete details and a guide on how to prepare your entries for our Welcoming Photo Contest II are available here. Congratulations to Silver Nikonians member Igor Voljc (IgorV), winner of the March segment of our Best of Nikonians - 2009 Images Photo Contest. Igor is from Ljubljana, Slovenia and his winning entry in theme of "Transportation" was a group of canoes on the river Ljubljanica. Igor used his Nikon D300 and Nikkor 20mm f/2.8 AI-s lens, shooting at ISO 200, with the lens aperture at f/8 and the shutter speed at 1/400s. His image drew praise from the panel of judges as an excellent example of composition techniques. 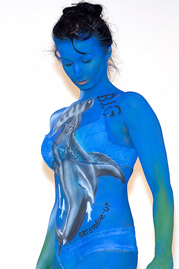 The current segment of the contest is now under way and the theme is "Water." Check the Contest Guidelines for details-- grab your camera-- and good luck! 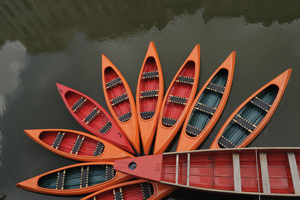 Congratulations to Nikonian Hans Zitler (Hans Ztz), winner for the second week of our Welcoming Photo Contest II 2009. Hans is currently a Silver Member from Germany, and he is a key account manager for a company which produces airbrush tools. Hans captured his image, entitled “Welcome Sunrays” in Bavaria, Germany with his Nikon D300 set to ISO 200 and his lens aperture at f/16. 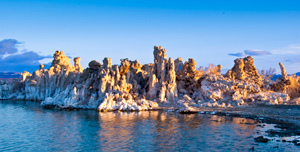 Hans tells us he got the D300 in January of this year, and he prefers to shoot landscapes. Photography is just one of his many interests. Hans is a Harley Davidson owner and he collects traditional knives. As his prize, Hans will receive a personal license code for Silver Efex Pro software by Nik Software (valued at $199.95 USD). Our First week winner in the latest Welcoming Photo Contest was Jim Hammond (hamjam) of California, USA. His photo was also a landscape image. Week Three of the contest has begun. Nikon updates the firmware for the popular D40 and D40X digital SLRs to improve compatibility with the EN-EL9a battery, thereby increasing the theoretical number of shots per battery charge. (link to Nikon USA firmware page). Rocky Nook's publishing team is preparing a new book project called The Wild Side of Photography, and they have extended an invitation to our Nikonians members to participate. The Wild Side of Photography project is one of many in the works over at Rocky Nook and their editors have extended an invitation to our Nikonians members who may have interesting tips and tricks to share. Rocky Nook Production Editor Joan Dixon tells us they are in the early stages of preparing this "somewhat different" book project and they have put out a call for contributors. A good example of the type of material being compiled can be found in our recent eZine-39, The Nikonians Official magazine (starting on page 13). Nikonians Gold Member Steven Shepard delivered an article with illustrations and a clear-cut description on how he has been able to accomplish macro shooting images in the field by mounting lenses backwards on his camera. He not only showed us the results, but also the somewhat ugly looking rig that made it all possible. You can download his article here. The "wild side" of this project is going to be the variety of interesting, clearly written and well illustrated segments, and the only limitations are your imagination and ingenuity. Not every article needs to be about technical fixes and patches. Interesting approaches to creative photography are also to be included. As an example, have you ever heard about the old trick of using a small glass aquarium like a glass bottom boat to shoot images in a swimming pool? Or perhaps -- remote triggering your camera while it is suspended on a balloon? Selected contributions will be published under the author's name along with a short bio and image of the author. And the author is entitled to 20 free copies of the book and a 30% discount on all Rocky Nook titles. Check out their large catalogs of titles here. Send your proposal to contact@rockynook.com and make sure you mention your Nikonians username. (We want to see how many of our members can make the "final cut"). The joint collaboration of Rocky Nook and our own NikoniansPress publications team has already resulted in three books. 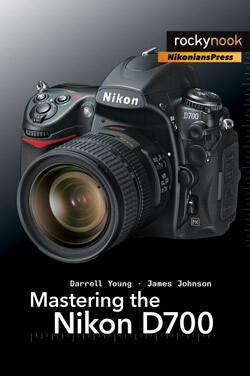 Our members are already enjoying their copies of Mastering the Nikon D300 by Darrell Young and The Nikon Creative Lighting System: Using the SB-600, SB-800, SB-900, and R1C1 flashes by Mike Hagen and the new Mastering the Nikon D700, by Darrell Young and James Johnson will soon be available. 31:14 Let the Image Doctors help you with your images! 54:24 Photo Prescription: It's the light, stupid! For the MP3 version of this podcast (audio only) click here (20.8MB). Active may be an understatement, -- the new D5000 Users Group is heating up with quick observations on the relative placement of this new DSLR in the overall Nikon line-up. Check it out. Nikon unveils new DSLR camera & Lens! Nikonians who expected to see the new Nikon D5000 unveiled at the recent PMA in Las Vegas can now relax. The D5000, featuring a swiveling LCD monitor and taking its place as the second Nikon with High Definition movie modes has been announced. The most immediately noticable outward physical appearance of the new camera is what Nikon calls a Vari-angle monitor. Old-time Coolpix users may fondly remember that functionality in the Coolpix 5000, but that model's swiveling screen was only 1.8 inches (compared to the D5000's 2.7 inches). The new D5000 is a DX-Format model featuring an image sensor with 12.3 effective megapixels and the proven Multi-CAM 1000 autofocus sensor module found in the Nikon D90. The D90 now has a Nikon junior partner in the "D-SLR with movie function category" and the price difference between the two is an appealing $200 to $250 USD (body only) depending on where you are shopping. Those who predicted the D5000 to be a mid-range choice between the Nikon D60 and the D90 pretty much nailed it. In this comparison shot below we used the only fixed variable (the contacts spread between the flash hot-shoe) to illustrate the size differences looking from the front. UPDATE: We have a new Nikonians D5000 Users Group Forum prepared for our members who will be interested in this camera. 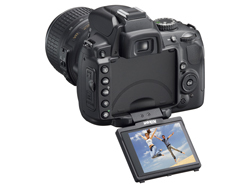 You can check out the features on the new D5000 with a downloadable pdf brochure. For a look at the official Press Release, check out the Nikon USA Press Center D5000 announcement. While you are there, make sure you check out the new AF-S DX-NIKKOR 10-24mm f/3.5-4.5G ED lens. This new lens gives you the FX-format equivalent of 15-36mm making it ideal for a variety of applications including restrictive interiors, architecture and sweeping landscapes. The D5000 should be on the shelves later this month at an estimated Manufacturer's List Price (MSRP) of $729.95 USD. The AF-S DX-NIKKOR 10-24mm f/3.5-4.5G ED lens should be available in May at an MSRP of $899.95 USD. As a follow-up to our earlier story on Ritz Camera's restructuring, the photo retailer chain has announced today that they will close 300 stores with a liquidation sale starting 4-April and continuing until all inventory is sold. A detailed list of stores affected is available here (Adobe Acrobat Reader required). Nikonians Corporate Partner Phase One has released their latest iteration of the Capture One 4.7 photo-processing workflow. Newly designed EIP file format that packages Phase One RAW files and settings together but leaves the original file untouched. JPEG and TIFF Files are now accepted as input and can be manipulated using the tools within Capture One, with the exception of the Lens Correction module. 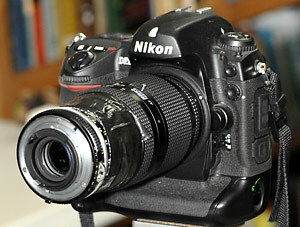 Added Tethered Capture support for the Nikon D3X and the Canon 5D Mark II. Nikonians co-founder J. Ramón Palacios (jrp) has launched a Nikonians Skins competition, opening the door for our computer savvy members to add new options to our choice of Nikonians skins. The current choices for your viewing choices include Nikonians Classic and Nikonians V2.0. Recognizing the insatiable appetite for customized skins shared by many of our members, the call is now out for those of you with a good knowledge of HTML and css sheets to participate in a re-design competition. Designers of the three best alternate skins will receive a Nikonians merchandise gift pack as a token of our appreciation. Check your formal invitation to participate (and deadlines/guidelines) here. 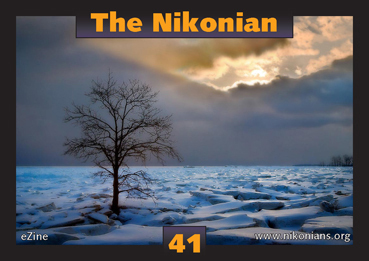 The latest edition of our eZine THE NIKONIAN #41 is now available for download. Featured in this edition of our official Nikonians publication are photos and articles originating from all parts of the globe, including Italy, India, Germany, Mexico, Romania, Canada and the USA ((to name just a few). You can right-click here for the free download (6,580 KByte PDF file). You need Adobe's Acrobat® Reader to view in your computer or print it (and it would be best if you used "Save As..."
As reported earlier here, Capture NX 2 Version 2.2 with Coolpix P6000 NRW support is now available for download (Nikon USA links).